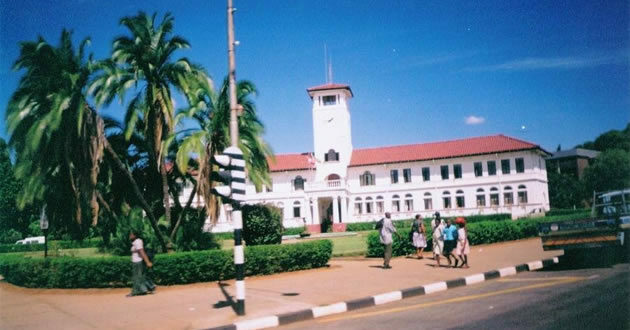 THERE was drama at the Gweru City Council Chambers on Thursday when the Chamber Secretary Mr Vakai Douglas Chikwekwe barred two councillors from attending a special council meeting accusing them of being late. The special council meeting started at 2PM. Clr Ernest Gudhuza of Ward 14 arrived at around 2:40PM when the meeting was already underway before he was turned away by security personnel who told him that they were working under Mr Chikwekwe’s instructions. Clr Gudhuza abruptly left after exchanging harsh words with the security personnel before Clr Tawanda Magidi of Ward 16 arrived about 20 minutes later. Clr Magidi tried to force himself into the council chambers but was overpowered by the security personnel and had to retreat. He eventually left in a huff. The commotion outside the council chambers attracted the attention of Mr Chikwekwe who emerged from the meeting and affirmed his position that no one would be allowed into the special council meeting if they were late. Mr Chikwekwe is a former Harare provincial magistrate and is notorious for having run-ins with employees who report late for work. Meanwhile, the full council resolved to attend this year’s Zimbabwe International Trade Fair (ZITF) against advice from management that is arguing that it is expensive to take part in the exhibition. Gweru Town Clerk Ms Elizabeth Gwatipedza argued that the cash-strapped local authority had no money for councillors’ allowances and hiring the pavilion for the week-long event. “The budget that is coming out is that it requires a minimum of $40 000 for us to exhibit at the Trade Fair but of that amount let me say that there are other fixed costs like rentals of the pavilion which will require $11 000 because we have outstanding arrears for the past two years. “We will also need to pay allowances to the tune of $8 000 for people who will be manning our stands and refurbishment of our stand will require between $8 000 and $15 000 and at the moment council coffers are dry,” she said. Despite that, councillors went ahead and resolved to attend the exhibition after tasking management to look for partners in the corporate world to share costs of the exhibition. Clr Tiripayi Chipondeni of Ward 2 called on the management to put in place measures to ensure that the city becomes visible at the trade showcase to attract potential investors. “If we are going to the Trade Fair as a tradition that every year we should go, then we are missing the plot because nothing tangible has come out from us exhibiting there. However, if we go there with a plan to lure investors then we should go and it is now incumbent on management to come up with a concept which will sell the city at the Trade Fair,” he said.